The White House responded to veteran journalist Bob Woodward’s forthcoming book on Tuesday, saying the explosive claims are "nothing more than fabricated stories." 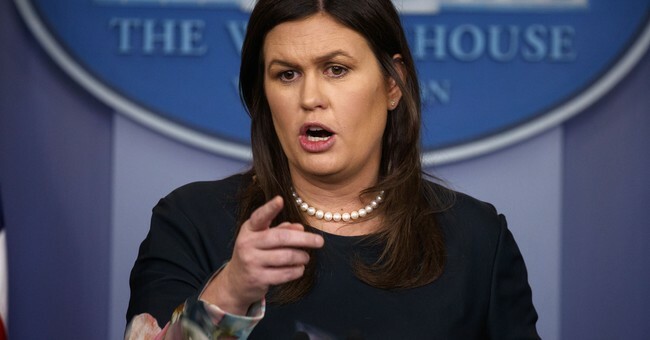 “This book is nothing more than fabricated stories, many by former disgruntled employees, told to make the President look bad," White House press secretary Sarah Huckabee Sanders said in a statement. She went on to list the Trump administration’s accomplishments. “While it is not always pretty, and rare that the press actually covers it, President Trump has broken through the bureaucratic process to deliver unprecedented successes for the American people,” she said. “Sometimes it is unconventional, but he always gets results. Democrats and their allies in the media understand the president's policies are working and with success like this, no one can beat him in 2020 – not even close." Among the explosive claims include White House Chief of Staff John Kelly allegedly calling the president an “idiot,” Trump reportedly blasting his Attorney General Jeff Sessions as a “dumb Southerner” and “mentally retarded,” Secretary of Defense Jim Mattis saying Trump acted like "a fifth- or sixth-grader,” and that aides took sensitive information off his desk to try to prevent him from making an irrational decision. As Cortney reported, former White House lawyer John Dowd denied calling the president a “f***ing liar” and Mattis also clarified that he did not use the words attributed to him by Woodward. Trump has slammed the book, suggested Woodward is a "Dem operative" who is trying "to divide." He continued on Wednesday: "The already discredited Woodward book, so many lies and phony sources, has me calling Jeff Sessions “mentally retarded” and “a dumb southerner.” I said NEITHER, never used those terms on anyone, including Jeff, and being a southerner is a GREAT thing. He made this up to divide!" He also tweeted out several statements from senior White House officials refuting the book's claims.